Recently Catherine and myself had some friends over to play some board games. It had been a while since we’d last got Settlers of Catan out and we certainly wanted to play that once more, but Catherine was also keen to test out a game from her childhood on our friends. She’d had this impulse on Christmas Day 2010 as well whilst we were at her parents house and she’d rushed upstairs to their extensive attic to try and find it. This is no mean feat as a substantial part of the attic is dedicated to books and board games. I always get the impression her parents never throw anything away. They live in a rather large Victorian house whose attic area is probably bigger than our entire house, and on the face of it is exactly the kind of place you think you’d love to live in until you realise how much the heating bills would be and just how much effort it would take to paint those extremely high ceilings. Anyway I digress. 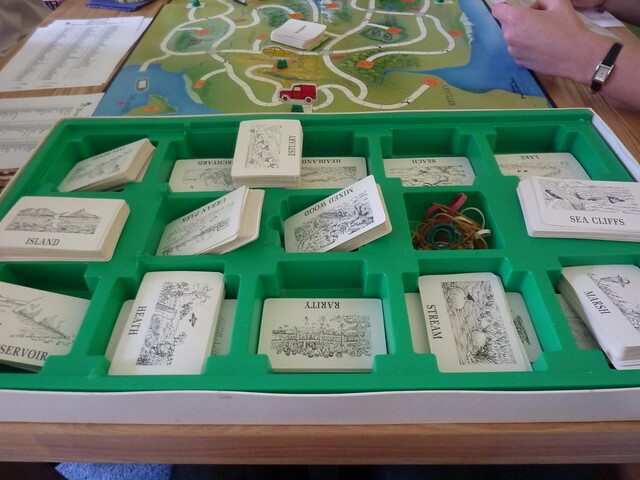 That Christmas Day the game was rescued from oblivion and I was introduced to 1980s madness of Bill Oddie’s Great Bird Race Game. So happy was Catherine to play it that she tucked it in our suitcase and returned to London with it. The game professes to bring about all the excitement and fun of bird watching. Having decided between a off road jeep or a sports car (I wonder which of those environmentally friendly options Bill Oddie uses on his own bird watching adventures) you drive around the board between different habitats in order to spot different birds. Real life is mirrored as much as possible. When arriving at, say, the Stream or Sewage Works, you pick up an “Arrival” card and may find that you’ve broken your binoculars or that a Sparrowhawk has scared all the other birds away. Some habitats require permits to visit so, quaintly, you have to stop off at a red phone box and ring up for one. And then when you’ve seen your birds you have to tick them off on your scoresheet which has over 200 birds on it. Each bird has a different score, which you also have to note down and there’s also some high scoring “rarities” to find as well. The aim of the game is to find as birds and the most points in your defined timescale – we chose 60 minutes, and at Christmas when we played with Catherine’s brother David and his wife Michelle, this got extremely frantic as we raced around the board trying to tick off as much as we can. The one thing Bill Oddie’s Great Bird Race Game does lack however is a defined way to chose who starts first. The instructions implore you to decide between yourselves. 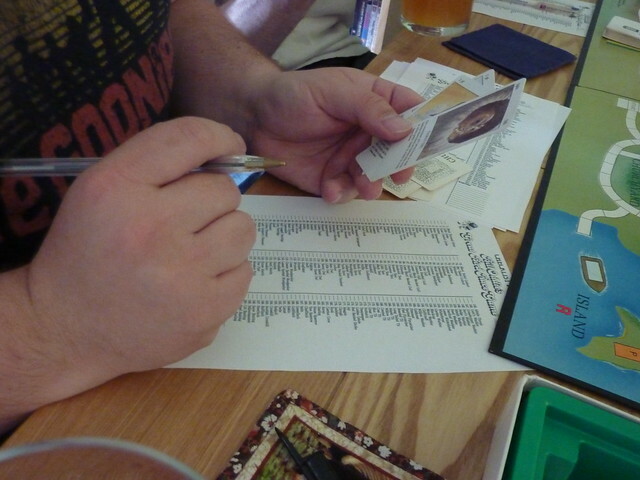 During our recent game it was decided that it should be “the person who looks most like Bill Oddie”. Having recently adopted a beard, this seemed to fall on me and we’d suggest this be a perfect way to start such an insane sounding game. For some reason Bill Oddie’s Great Bird Race Game (incidentally Bill Oddie didn’t create the game, just lent his name to it) is no longer in production. 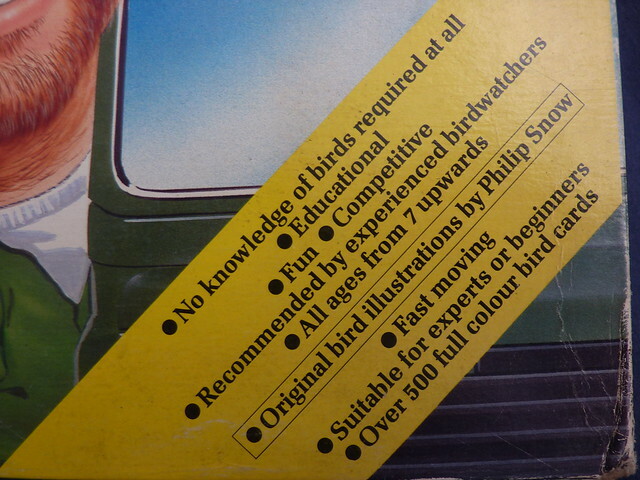 Perhaps the thrills and excitement of bird watching just didn’t attract the punters even with Bill’s name on the box. If you want to play you might just have to come round here. Just don’t come with a beard. Cos I’m certainly going first.